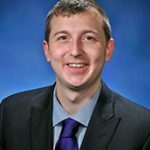 Michael Krombeen is the legislative aide for State Representative Rob VerHeulen, Chair of Appropriations Subcommittee on Transportation and Vice Chair or Appropriations Subcommittee on Department of Community Health. He oversees and implements the legislative agenda for Rep. VerHeulen and manages his office communications and constituent outreach. Previously, Krombeen worked for State Representative Frank Foster. Krombeen, a native of Grandville MI, holds a Bachelor of Science from Grand Valley State University, and is currently working on his Master of Public Administration through Western Michigan University.